Before going any further, let me clarify my intent with this post. There is a translation process called “adaptation”, but unfortunately, adaptation is not the topic of this blog post. 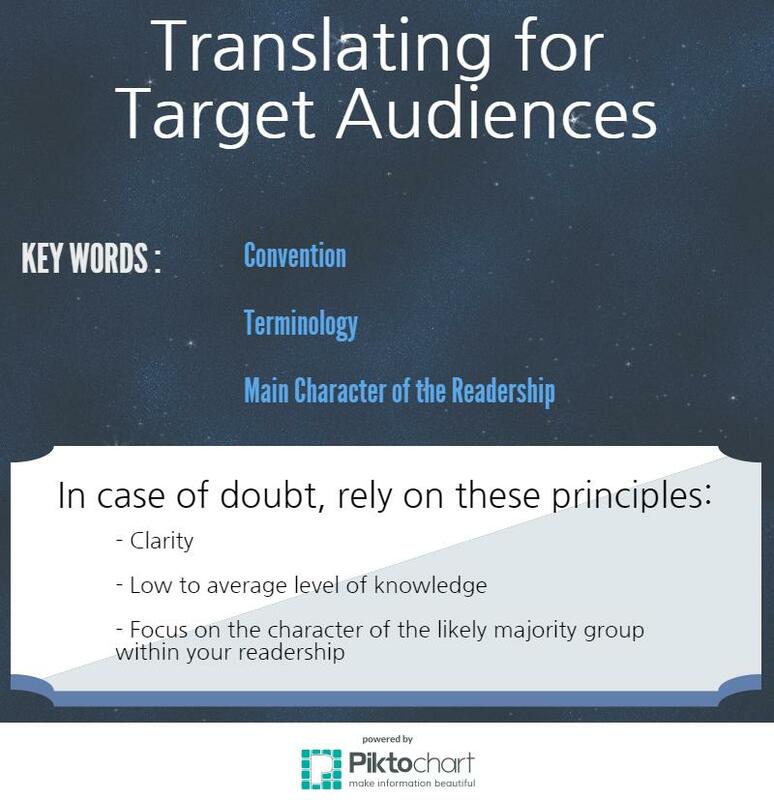 I will be addressing a matter every translator faces every single time he or she starts working on a document: translating for a target audience. In other words, I will be addressing criteria, cues or guidelines on how to choose the tone, the voice, and the terminology. The very first step is to identify which document you have to translate. A press release and a memo have different purposes and target readers and they have a different structure, so do reports and letters, and blog posts and newsletters. Beware: sometimes there are also differences within the same types from one language to the other. For instance, business letters in French seek to establish a one-one-one connection, whichever the purpose of the letter might be. Whether the purpose is to request information or to complain, French will use the first person to seek action or information from one person, the addressee. In English, however, more often than not, the letter is written in the third person as dictates formality in business writing. In other words, which group is likely to read the piece of communication that needs to be translated? Sometimes, the answer to this question is clear cut, but other times, identifying your target audience requires more consideration. For instance, a letter goes to an addressee; an article gets published in a scientific magazine; an electronic newsletter is delivered to addressees who are either knowledgeable of the topic or interested in learning about it. Such documents come with very strong cues. However, some pieces of communication target a broader audience, people whose level of education vary and whose knowledge of the topic might also vary greatly. Conventions: most types of document have set conventions and protocols already widely spread, like business writing, social science writing, etc. The newer media channels allow more creativity and trendier formats, such as blog posts, social media postings. Terminology of the source text: unless specifically asked to adapt the text to a different audience, keep it on the same level as the source text. Focus on the character of the majority group: establish the level of education and the likely level of knowledge of the topic of your readership. Low to average level of knowledge: write it so the beginner does not get confused, and the expert does not get bored within the first fifty words. The former will appreciate the additional information and the latter will either move on when realizing the text is of no use to him or appreciate that you are establishing your own expertise on the matter with the accuracy of your knowledge of the topic. Focus on the character of the likely majority group: figure out as best as you can the traits of your most likely readership.